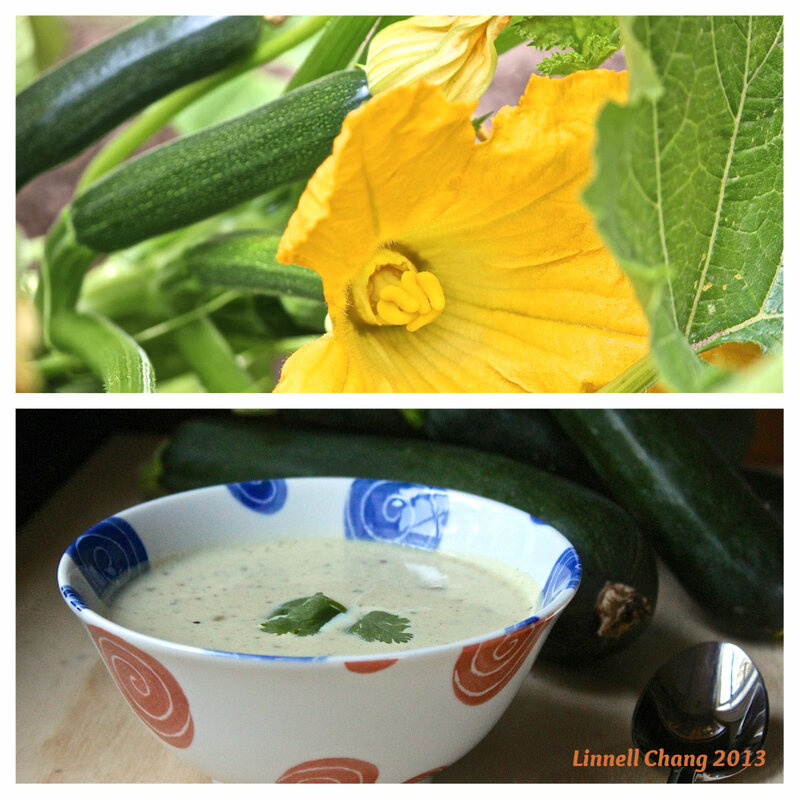 Zucchini Soup | What about this? While waiting for a clerk at a used book store to sort through my bags of audio books, I casually walked up and down the aisles. A magnetic force, of some kind, pulled me to a bookcase in the far corner. That’s where my husband found me — sitting on the floor with a pile of cookbooks. He looked at me and said nothing. I could tell he was thinking, “Great, that’s all she needs is another cookbook.” I looked back at him and quickly said, “Don’t worry, I’m not buying all of these! I’m going to narrow it down to just one.” And I did. Susan Branch’s cookbook, with its tried and true recipes, lovely watercolor illustrations, handwritten pages, and a terrific price tag of $2.99, proved to be “the one” for me. It was serendipitous, as freshly harvested zucchini sat on my kitchen counter, waiting to be the stars in a delicately-flavored zucchini soup recipe from my new cookbook. 1. Sauté onion in butter several minutes. 2. Add zucchini and water. Simmer 30 minutes. 3. Remove from heat; cool slightly. 4. Blend in blender at high speed until puréed. 5. Return to saucepan. Add the rest of the ingredients and heat to simmering. Serve. 1. Because the zucchini from my garden were large and because I didn’t want to waste half a zucchini, I ended up using 5 cups. The next time I make this soup, I will use five cups of zucchini again. 2. I used fat-free half & half with perfect results. 3. Because condensed soup contains a fair amount of sodium, I added very little additional salt. 4. Since zucchini and basil are both summer produce, I will try adding fresh basil to the soup the next time I make it. The equivalent of dried herbs to fresh herbs is usually 1 teaspoon dried = 1 tablespoon fresh.